Having a missing tooth or a series of teeth can dramatically affect your smile. It can also affect the function of your mouth and interfere with chewing and speaking. Over time, the jaw can actually lose bone, which leads to instability. At Harmony Dental Health, we understand how important having a full mouth of teeth is for a variety of reasons, which is why we offer dental implants in Fort Washington and to the surrounding areas. These implants will not only function like your natural teeth but they also look real so no one will even notice. Dental implants can be used to replace a single tooth or a series of teeth. Implants are perfect for those who have a gap due to one missing tooth, but they also work to help stabilize dentures in mouths missing multiple teeth. A full arch of teeth is supported by multiple implants. Unlike removable dentures, implants will anchor a denture into place and it will not slide or move. This is beneficial in that a custom denture can be a permanent placement rather than something that you take out and have to secure back in with messy pastes. If you are a resident in the Fort Washington area, our dental implants expert may be able to help you. Understanding the individual unique anatomy of your mouth is important before starting the implanting procedure. We use 3-D diagnostic imagery and then plan a customized approach. Minor surgery is necessary to place an implant. For most of our patients, we use mild sedatives or local anesthetics to anchor a titanium post in the jaw bone. The stabilization of the implant comes from the fusion of your jaw bone to the post, which takes a little time. Once stabilization has occurred, we attach the custom-made prosthetic, which is either a dental crown for replacing one tooth or a set of dentures. Recovery is minimal and patients should notice very little discomfort. While it will vary for everyone, the entire process can take between six to eight months, and the results will last forever. Dr. Paola and staff would be happy to sit down with you and discuss your dental needs and how implants can improve your smile. 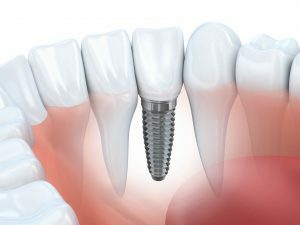 Looking for the dental implant experts in Fort Washington? Call Harmony Dental Health today!